Overview: Currently, climate changes or alterations are known to be reflected on the stable isotope ratios of Hydrogen, Nitrogen, Carbon, Oxygen and Sulphur present in atmospheric gas forms, fresh or ocean water, as well as in plants and animals and organic matter in the soil. Samples from those matrices can provide a record for such changes across a given length of time and / or space. Also, ecological and physiological processes often reflect on stable isotope ratios, again setting a record in plant, animal or other living tissues. Many such processes will establish typical “isotopic signatures” which can allow for a geographical discrimination of the origin (or growth) of a given living tissue; at the same time, the time scales involved in establishing those isotopic markers will depend upon metabolic turnover time of a given isotope, residence time of a given organism or cycling time in the ecosystem. 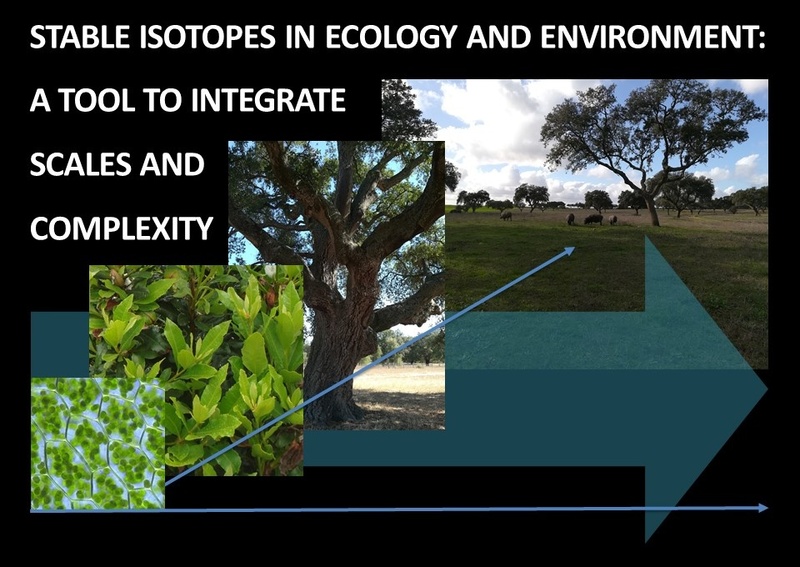 For those, and other, reasons, stable isotopes ratios are widely used in diverse ecological areas of research, integrating multidisciplinary approaches together with biochemistry, molecular biology, physiology geochemistry and climate sciences. Objectives: Introduction to stable isotopes ratios as tools to understand global, ecosystem and community level bio/geo cycles;Light isotopes: H, N, C, O and S isotopes, geo cycles and ecological significance;Sampling and analytical methodologies in stable isotope analysis. This course can have a recognition of 6 ECTs for FCUL PhD students enrolling in it as part of their first doctoral year. For students only requiring 5 ECTs recognized in their specific PhD programmes the last 6 hours of the course are not mandatory and the certificate will be on 'Topics in Stable Isotopes in Ecology’. Minimal formation of students: Bachelor in Biology, Natural Science or related areas. Directed to: Teachers, researchers, 2nd and 3rd cycle students, laboratory technicians in the areas of environmental studies, ecology, health, ecosystem management, conservation. Reading stable isotope ratios in global, ecosystem and community level bio/geo cycles; geological and historical record; isotopes as proxies for ecosystem functions and human activity. Water, CO2 and Nitrogen – the major natural bio/geo cycles, their relations to climate change and human activity; Sulphur and fossil fuel pollution; N and C in food webs; forensic applications; isoscapes. Sampling and matrices: sample preparation in diverse matrices (plants, animals, soils, specific compounds).